We are very pleased to be able to list the cartoonist attendees at this year’s Shrewsbury International Cartoon Festival. They are: Huw Aaron, Charlie Adlard, Dean Alston, Nathan Ariss, Ian Baker, Rupert Besley, Steve Best (Bestie), Andrew Birch, John Clark (Brick), Matthew Buck (Hack), Steve Chadburn, Jonathan Cusick, Wilbur Dawbarn, Pete Dredge, Noel Ford, Clive Goddard, Tim Harries, John Landers, Alexander Matthews, Rob Murray, Chichi Parish, Roger Penwill, Helen Pointer, John Roberts, Royston Robertson, Chris Ryder, Bill Stott, Cathy Simpson, Rich Skipworth and The Surreal McCoy. The festival patrons Libby Purves and Alex Lester will also be attending. We will be publishing details of the itinerary over the next few weeks ahead of the festival’s first events. The main weekend for the live cartooning and other public events is 19-21 April. Get it into your diaries! We are sad to note that Bob Godfrey, the much-loved cartoonist behind Roobarb and Custard (above) and the equally wonderful Henry’s Cat, has passed away at the age of 91. Obituaries for the Oscar-winning animator can be found at The Guardian, The Telegraph and the BBC. The Guardian also offers a guide to Godfrey’s career in clips. In a sad coincidence, Richard Briers – who narrated Roobarb – died last Sunday. The Telegraph is celebrating 25 years of pocket cartoons by Matt Pritchett, with a series of short videos in which the cartoonist discusses his work and looks back over his career so far. Begin by finding out about Matt’s typical day; other clips look at his first front-page gag, the tricks of the trade, his favourite cartoon of 2013 thus far, and how he’s turning into one of his characters. Jamie Smart has plans for a new children’s comic, initially to be made available online for free, in which all characters will be creator-owned. He is on the lookout for cartoonists to join his Moose Kid Comics project – for which he hopes to attract investors and subsequently launch in print form. Read more and find out how to get involved here. Finally, a Google doodle on Friday celebrated what would have been the 88th birthday of Edward Gorey. See the doodle at full size here. Technology moves on all the time and there is no reason drawing shouldn’t be part of change. For evidence, the crowd sourced fundraising platform Kickstarter is currently hosting a novel adaptation of the 3D printing technology from a startup called WobbbleWorks. You can watch a short video about what their 3D pen can do below. The third annual Success in Comics seminar was held at the weekend in Maryland in the US. Despite the name, it covers all areas of cartooning and cartoon illustration and focuses on how freelancers can make their business grow. Success in Comics is organised by Chad Carpenter, creator the self-syndicated cartoon Tundra, above, and his marketing/sales manager Bill Kellogg. Above: The Pope wins the lottery and decides to quit his job, in an eerily prescient cartoon by Katharina Greve that appeared in a calendar on the very day of Pope Benedict XVI’s announcement. Journalist Matt Geörg Moore argues that comic strips in print should be given more space and more freedom, despite the decline in newspaper revenues. Read his argument here. Wally Fawkes, the cartoonist and jazz musician better known to cartoon fans as Trog, has been named one of the Oldies of the Year by Richard Ingrams‘ magazine. Read more about Fawkes, and the other Oldies, here. Finally, some news of contests and awards. The BBC has launched a competition asking illustrators, photographers and film-makers to share their visions of the future. Meanwhile, the nomination process has now opened for the 2013 British Comic Awards. Heard the one about Twitter jokes? “Everyone’s a comedian” is a phrase often uttered sarcastically, but with the rise of the Twitter joke it almost seems true. If you’re not familiar with the phenomenon you need to be hanging around on Twitter when a major news story breaks. Recent stories such as the horsemeat scandal, the resignation of the Pope, and the unearthing of the body of Richard III, have provoked huge numbers of jokes (click those links to see some of them). Some are by those in the business of writing jokes but most are not. Of course there are plenty of clunkers, and quite a few groaners, but a lot of them are really rather good. And it leads to a bit of a problem for cartoonists: how do you follow that? It can be tricky to come up with new and original ideas, possibly to be seen a day – or several days – later, in an age when a colossal wave of jokes travels around the world as soon as a story breaks. Well, the simple answer is that you just have to up your game. Of course, you can’t read every tweet to make sure your joke hasn’t been done, you just have to get on with it. Twitter is clearly here to stay, so there’s no point in complaining. 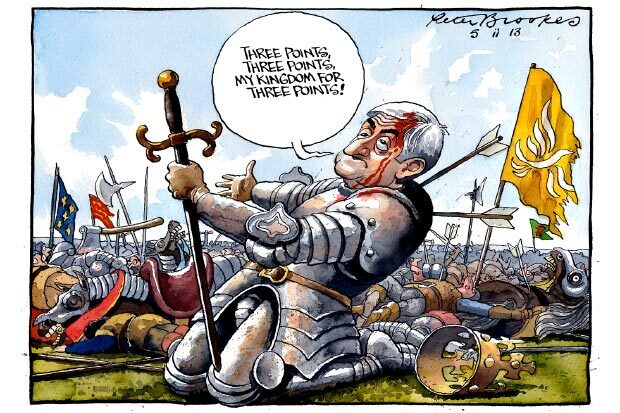 For political cartoonists, the problem is even more acute as people have taken to predicting on Twitter how the following days cartoons will turn out, most notably when the Richard III story broke on the same day that the MP Chris Huhne changed his plea to guilty. As predicted by the Twitterati, some cartoonists did combine the two stories. But if it is done with enough skill and original thought, it’s clear that there is a big difference between a beautifully crafted cartoon and a 140-character quip. Ultimately, what the trend for Twitter jokes tells us is that millions of people love to look at the world and all its problems through the prism of humour. And that has to be good news for cartoonists. Editor asks: Do you agree? Please tell us what you think in the comments. It is sometimes assumed that cartooning is a purely static medium. One of our members, Robert Duncan, shows this isn’t the case in this three-minute plus video celebrating the work of the writer and cartoonist Edward Lear. If you have seen any other good examples of cartooning as a moving medium please post them into the comments below. Kevin Siers, editorial cartoonist for The Charlotte Observer, has found his name on a list of hostiles kept by the National Rifle Association. Read Siers’ response here. Mike Lynch tells an amusing story – through the medium of cartoons, naturally – about his early attempts to sell gags to that most notoriously esoteric of markets, The New Yorker. Read The Petty Indignities That Ruin My Life here. Elsewhere, New Yorker cartoonists have been trying out an Etch A Sketch app – with decidedly mixed results. The experiment was so disastrous for Mick Stevens that it resulted in him speaking out against all forms of digital drawing. Read more, and see their attempts, here. Lafayette, Louisiana newspaper The Advertiser provides a full and comprehensive answer to a reader’s question about how political cartoons are selected (be sure to click through to page 2 for the full response). And finally, for those with an interest in animation, Complex.com has compiled a list of 25 cartoons that aren’t for children. The Procartoonists.org members Pete Dredge and Graham Fowell have been singled out in the “Special Mention” category at the 18th Dutch Cartoon Festival. The theme of the exhibition was “Prejudices and Stereotypes”. The full list of winners can be seen here. We send our congratulations to Pete, Graham and all the winning cartoonists.